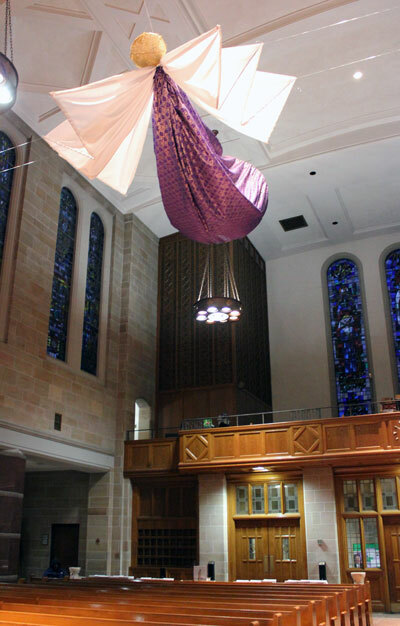 Skillfully crafted by parishioners Ann Regbeer and Mireille Leys, the winged figures are a sight to behold: 10 feet in length, arrayed in flowing silk robes and suspended from heavy-gauge fishing line more than a dozen feet above parishioners’ heads. One angel has appeared each Sunday of Advent, and the fifth and final figure will be installed above the altar for the Christmas Vigil Mass. Donning festive green garb, the angel will float above an image of parish families gathered around a crèche. “Angels are symbols in many ways,” said Father William Murphy, C.P., pastor. “The hope was that this would open parishioners’ imaginations in a three-dimensional, colorful way. Like the angels in Scripture, the first two angels arrived unannounced and were meant to take parishioners by surprise. By their appearance and attire, they suggest that something special is about to happen, and invite parishioners to reflect on that. As the weeks progressed, Father Murphy wanted to add more meaning to the figures. And so the angel for the third Sunday of Advent, or Gaudete Sunday, wears white with rose-colored wings, a symbol of the impending joy of Christmas. “This one holds an open treasure chest, and in this chest is the treasure of God’s Word,” Father Murphy said. He explained that it invites parishioners to reflect on what God’s Word is to them, and evokes a spirit of joyful anticipation for the Word that will become flesh. Last weekend’s symbol was a house, and in the Gospel, an angel tells Joseph not to be afraid to bring Mary into his home. It can be seen as a sign of God making a home among His people, and His people not being afraid to welcome Him into their lives. Welcoming the angels into church for Advent was an idea that Father Murphy began discussing with the liturgy committee last May. His inspiration came from small angel figures, created by the mother of Dorothea Breen, Immaculate Conception Catholic Academy’s principal, which were sold at the parish Christmas Fair last year. “They were simply made and we sought to imitate them on a giant scale so we could hang them,” he said. His next step was inviting Leys and Regbeer to turn this idea into a reality. 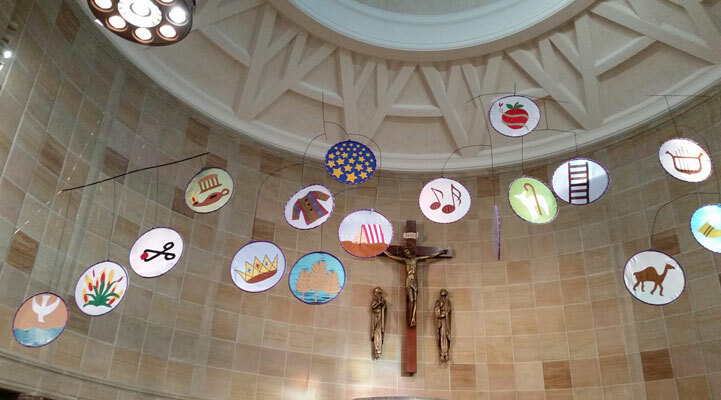 Last Advent, the two women created 23 Jesse Tree symbols in hula-hoops that hung above the altar so he knew they had the skills and talent for this endeavor. Making the prototype for the angels “was really a trial and error thing,” said Leys, a retired accountant who is proficient with a sewing machine. 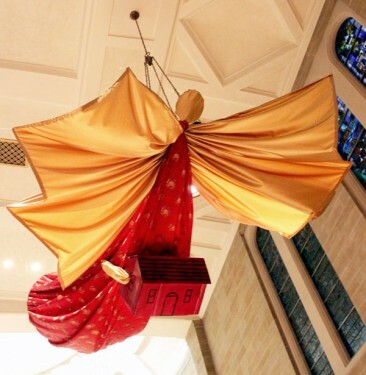 The original angel was “so enormous,” she said, that they had trouble getting it through the church doors. They had to refine the size, shape and framework to make it easier to handle. 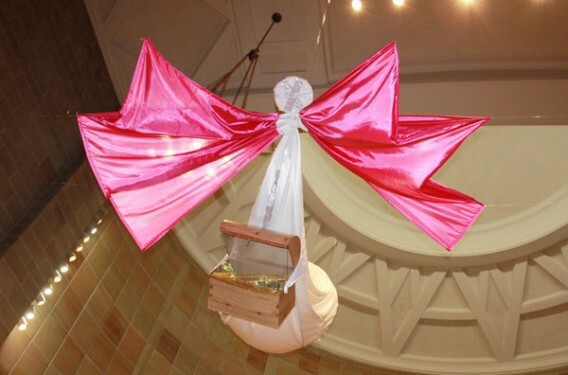 In the final version, cardboard forms the base and steel wires provide a firm, but not overly heavy structure to the angels’ bodies and wings. Richly hued silk fabrics give them a stately appearance. For the angels’ heads, Father Murphy tried his hand at papier-mâché, using an ornamental pumpkin as the base. That didn’t work out as planned, he said, laughing. Ultimately, they opted to use lightweight Styrofoam discs from the local craft store. 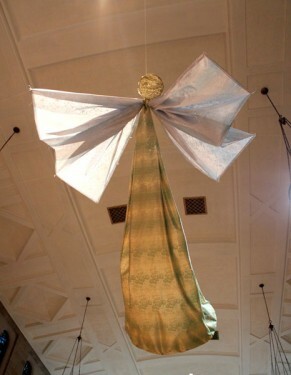 Regbeer, an interior designer who specializes in custom-made draperies, said each angel took only an hour to make. But several hours and people were needed to assemble and suspend each figure from ventilation grates in the ceiling. Fishing wire tied from the angels to hooks along the church walls provide further support. Reactions to the angels have ranged from delight to confusion. 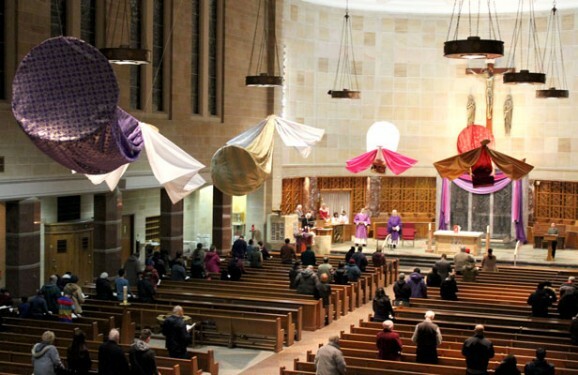 While most people realized the angels were there for Advent and were glad to see them each week, at least one parishioner thought they were fish. Another believed they were Our Lady of Guadalupe decorations. And for a small few, the angels seemed a bit too avant-garde for their tastes. “I like that creative tension, that some people might not like it or would express doubts. That’s ok,” Father Murphy said. “We won’t all see it the same way. Maybe it’ll cause dialogue and get people to think. Over the last few weeks, he has invited parishioners to come to church to meditate and pray in the presence of the angels. He finds them especially beautiful during the day when the church’s stained-glass windows reflect colored light onto them. Parishioner Josette Montas walked around before Mass snapping pictures of the angels, which she says have gotten her in the mood for Christmas. “It’s a very nice idea. It makes me feel like something is going to happen, like ‘He’s coming!’ They make Advent something special,” she said. For Peggy Robertson, the figures have shifted her perspective. 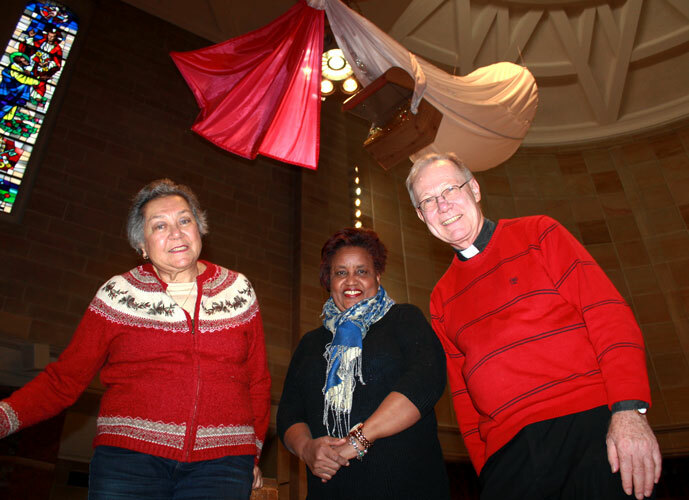 “I never thought of angels during Advent, but now I do,” she said.